mom go green: paper or plastic? How about neither? San Francisco has been proposing a tax on grocery bags. It is meant to help encourage the use of reusable bags and also help to clean up the litter that plastic bags create. I figured if the tax might happen, I may as well give reusable bags a try. (Even Ikea is starting to charge 5 cents for each disposable plastic bag). I found reusablebags.com and bought a starter set of the Acme Workhorse bags. I love them! I always get compliments from the grocery checkers because they are compact, easy to use, and hold so much. They also sell a starter kit that comes with canvas produce bags (quite handy). Since 2003 ReusableBags.com has been a major force providing facts and news on the global push to reduce plastic and paper bag consumption. Plus, simple actions you can take to help the cause. I don't know about you, but seems like I spend lots of time at the grocery these days. Carrying my own set of bags is very easy, and one way that I can make a difference. I also just recently purchased some ACME Workhorse grocery bags. We've had our second big grocery run with these, and they're great! One bag easily holds as much as two plastic bags (we have seven for a weekly run for a family of four). Less bags, and less trips to and from the car. I like that these are lightweight, compact, tear-proof, and washable. Our grocery checkout staff also love these. Everyone asks where we bought them from. Excellent product and highly recommended! http://www.brightandbold.com/enmiba.html) and I just love them. I can actually carry all 5 over my shoulders and in my hands at once... and that's a lot of groceries!! i have to admit that recently i've been using bags that have longer handles so that i can load them over my shoulders as i carry our groceries up 2 flights of stairs. you're right, trina. 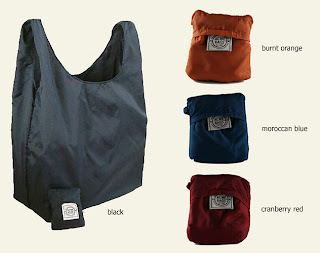 whatever style reusable bag that suits your fancy is better. i even have sewn one of my own!